Offering both on and off-road use, the Bridgestone Dueler A/T 693 provides solid all season traction to go with a comfortable ride and a longer tread life. Bridgestone has used its advanced technology to build a suitable tire for driving on all terrains. Looking at the tire you will see that the tread design is well balanced with a symmetric tread pattern. This type of pattern results in a smoother ride and prevents you from feeling tired while driving for long hours on the highway. Moreover, the tire is quiet, a good thing if you are driving at higher speeds. Bridgestone has used its Dual Layer Tread Technology to provide enhanced wet traction with minimal tread wear. It has also used its latest Duratech tread compound, which ensures a prolonged tread life through the minimizing of tearing or chipping on rough surfaces. Handling on the Bridgestone Dueler A/T 693 is excellent due to the use of a semi stealth block with a circumferential center rib. You will be impressed while driving in wet weather due to the treads ability to flush water from underneath the surface of the tire. Off-roading is good on these tires due to the tire’s excellent traction for varied surfaces. Snow traction is above average with its saw tooth grooves that provide grip in snow. A unique shoulder tread design has been kept for providing assistance on wet surfaces. With the Dueler A/T 693 you will not need to worry about the risk of hydroplaning in wet weather. Two strong steel belts in the tire have been reinforced with spirally wrapped nylon for additional strength and a longer treadlife. Bridgestone has incorporated O-Beads, a wrapped bead wire through the circumference of the tire for further improving handling and enhancing the life of the tire. 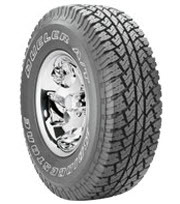 Overall the Bridgestone Dueler A/T 693 tire is a nice all-terrain tire that rides comfortably on the highway as well. We are not too fond of using a P metric tire for much off-road use though. .
Prices for the Bridgestone Dueler A/T 693 Tire range from around $230 for the 16 inch series tire to approximately $199 for the 18 inch series tire. If we have a valid coupon for this Bridgestone tire, it will be shown below. You can find all other tire discounts and review. Who Are Bridgestone Dueler A/T 693 Tires Designed For? The Bridgestone Dueler A/T 693 is designed for drivers of minivans, SUVs and crossovers who are seeking a tire for all-terrains and all-season driving. Bridgestone does not offer a mileage warranty on Dueler A/T 693 tires. However, there is a first 2/32 inch of treadwear guarantee on the tire’s uniformity. You’ll also find a materials and workmanship guarantee for 5 years. It includes a free tire replacement during the first 2/32 inch of wear, followed by a prorated amount down to the final 2/32 inch of useable tread life on the tire.